Dr. Joe Isaacson is committed to the smiles of adults and children alike. After all, every smile is vulnerable to conditions like gum disease and tooth decay, not just mature smiles. 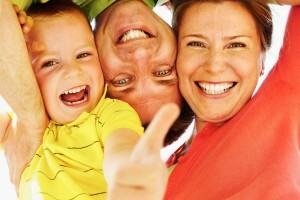 So to help families from Oklahoma City and beyond, we offer great family dentistry services to help all age ranges. One of the best ways we can provide preventive family dentistry is with an oral exam. During an oral exam, Dr. Isaacson can closely inspect teeth and gums for signs of tooth decay and gum disease. We also look for signs of tooth wear, which might indicate a struggle with bruxism or TMJ dysfunction, and we perform oral cancer screenings. Catching any of these conditions early lets us provide effective care sooner, when it can be more comfortable and less invasive. With all that in mind, one way we can help you and your family is with dental sealants. This popular family dentistry service uses a thin, plastic coating to physically protect teeth from decay. A similar service – fluoride supplements – draws important minerals and nutrients to teeth, strengthening spots that have softened. With both of these, Dr. Isaacson can help patients, and especially young patients, preserve their oral health. Other services, like nightguards and athletic mouthguards, can protect teeth in situations where they are vulnerable. And lastly, as part of our dedication to family dentistry, Dr. Isaacson and his team are always happy to recommend products or techniques for better at home care. Has it been more than two months since you or your child’s last checkup and cleaning? Call Dr. Isaacson’s dental office in Oklahoma City to reserve an appointment. We gladly serve patients from Edmond, Yukon, Piedmont, Mustang, and beyond.